Want coconut milk shampoo!It definitely have to smell great! Wow, what beautiful hair. And I've never heard of these products which I'll check out. I'm planning a big hair-change soon. It's hard for me 'cause I don't have the history with hair that women like you do. Argh...I'm growing my hair out, at the moment it's in that weird in-between stage. Love these hairstyles though...one day...I have to stay strong and keep at it! 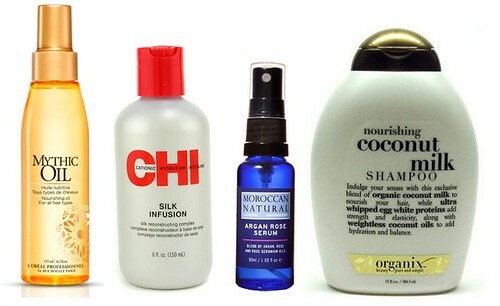 And that Moroccan serum is AMAZING! This inspires me to learn how to do my hair better. I'm such a wash-and-go person, it's not even funny. But I want curls! And braids! But anyway, have you used CHI products before? I have and they're all fantastic. My hair is very sad now. Pretty inspiration, I love those braids and waves.